A hilarious video of a black bear as it falls out of a tree. 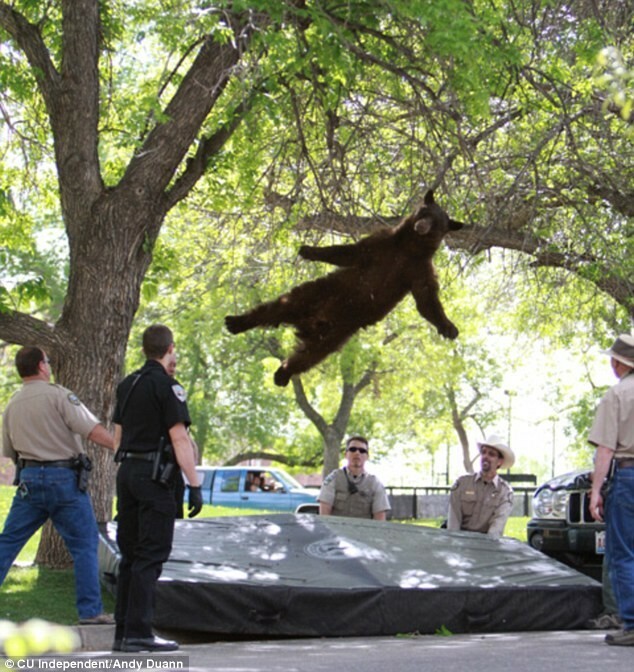 The large black bear was tranquillised by wildlife officers after it wandered up a tree at the University of Colorado. The 200 pound bear had spent almost a day on the university campus before officers decided to sedate him to protect the students. The officers caught him on a big mat after he was shot with a tranquilliser dart. He was then transferred to a large cage, tagged and then released back into the wild in the mountains of Boulder. What makes the video so funny is that as he falls, the black bear’s arms and feet are comically stretched out.